The Chic Bargainista®: Tacori Brings the Red Carpet to LuckyFabb: Lights, Cameras, Diamonds! 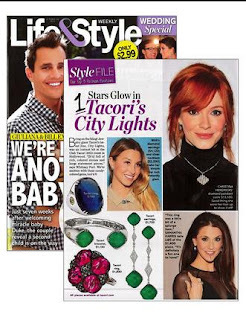 Tacori Brings the Red Carpet to LuckyFabb: Lights, Cameras, Diamonds! It was like the Oscars for fashion bloggers last week in Los Angeles. TACORI, the legendary fine jewelry designer known for exquisite platinum and diamond rings, created a Red Carpet experience to celebrate Lucky Magazine's second annual Fashion and Beauty Blogger (FABB) event at the SLS Hotel in Beverly Hills. Tacori brought more than 1.5 million dollars' worth of diamonds to the Lucky FABB event by showcasing fabulous "RoyalT" platinum engagement rings (all of which feature center diamonds that are 3 carats or larger), the newest designs from the "City Lights" fashion collection, as well as items from "The Vault", which are one-of-a-kind platinum designs and which have been worn to the Academy Awards, the Emmys and more. The City Lights collection is full of beautiful colored stones and big statement pieces. Believe me, they can make any girl feel like a million. Stay tuned as I will be posting more about the TACORI pieces that I received at LUCKY FABB. 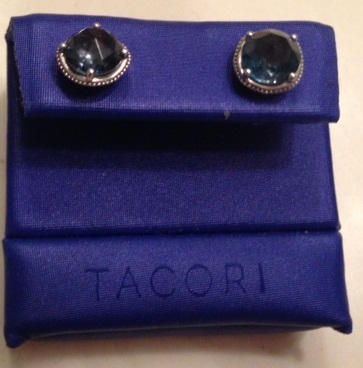 I own a gorgeous pair of TACORI blue stone quartz studs that I love for going from casual to evening. (see picture above.) Look for TACORI at fine jewelers like Robbins Brothers.